Do You Know? 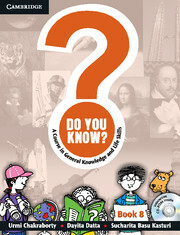 is a general knowledge series for classes 1 to 8. Do You Know? is a general knowledge series for classes 1 to 8. It urges students to ask questions and seek answers by engaging critically with the facts. The content is structured into units corresponding to a wide range of topics. Some of these topics include world events, sports, literature, logic and mathematics, art and culture, etc. The design of the series is unique, child-friendly and attractive. Learning happens through a process of exploration and discovery, involving games, activities, experiments, etc. Unit covering diverse disciplinary area. An interesting variety of innovatively designed activities to make learning enjoyable. ‘Knowledge bank’ to provide additional information. ‘Knowledge Search’ to arouse curiosity. ‘Fun Time’ containing enjoyable activities. ‘Do it Yourself’ to provide suggestions for research-based projects. Interactive CD-ROM with brilliant graphics and audio-visual extravaganza.